A series of three documentary films, directed by award-winning film directors who are also alumni of Notre Dame’s College of Arts and Letters, will be released on the WatchND app and the UND.com website during the last three weeks of this year. The series, “First Time Fans,” presents the excitement and wonder of some very different people as they experience a Notre Dame football game for the first time. “First Time Fans” will begin Monday, December 15, with Blind Faith, directed by 1988 Notre Dame alumnus Greg Kohs. 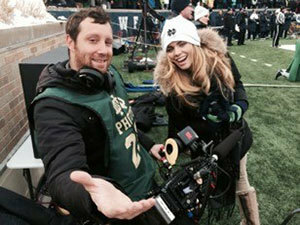 Kohs, a Philadelphia-based filmmaker, followed Mitchell, an eighth-grade student at the Indiana School for the Blind and Visually Impaired, from his home in Indianapolis to the Notre Dame campus last October for the Notre Dame-Stanford game. At Home with the Irish will be released Monday, December 22. This film also concerns that Stanford game weekend, when Los Angeles-based filmmaker Justin Mitchell, a 1995 Notre Dame alumnus, and fellow alumnus Steve Camilleri, director of South Bend’s Center for the Homeless, took two teenage residents of the center, Alliyah and Felisha, to see their first Notre Dame football game. On Monday, December 29, #AnnaLynneGoesToCollege will be released. Set at Notre Dame during the snowy weekend of November’s Northwestern game, this film, directed by New York-based filmmaker and 1993 Notre Dame alumnus Michael Canzoniero, follows the television actress and 90210 star AnnaLynne McCord on an eventful campus visit to speak as an advocate for victims of sexual assault. The three films were produced with funds from Notre Dame’s College of Arts and Letters; the Institute for Scholarship in the Liberal Arts; the Department of Film, Television and Theatre; the Mary Pergola Parent and Dr. Thomas Parent Endowment for Excellence in Filmmaking; and Fighting Irish Digital Media.